Grambling's storied football program is in complete disarray. On Tuesday, players walked out of a meeting with coaches and administrators. On Wednesday, they skipped practice altogether in protest, then repeated the boycott again today. And interim coach George Ragsdale has reportedly been fired. The players aren't happy about how they're being treated, but they're not alone. Heavy cuts in state funding have wrecked the school's athletic budget, and everyone—players, coaches, and administrators alike—is bearing the brunt of it. According to the Shreveport Times, the players are upset because they had to take buses to recent games in Kansas City (approximately 1,200 round-trip miles) and Indianapolis (1,500 round-trip miles). They're also not happy that coach Doug Williams—the program's most distinguished alumnus—was fired last month, just two games into the season. But the roots of the problem go much deeper. In 2009, Louisiana governor Bobby Jindal turned down stimulus money from the federal government. That same year, Jindal cut $219 million in state funds for higher education, including $5 million that would have been earmarked for Grambling. In January 2012, Jindal announced an additional mid-year budget cut of $50 million for higher education, with Grambling losing out on nearly $1 million of that total. This is not chump change. The university will continue to reduce the amount of funds transferred from the operating budget to the athletic department. To absorb these cuts, the Department of Athletics has eliminated the golf and men's tennis program and will reduce athletic competition to NCAA minimums for each sport. The Department of Athletics has implemented major cost-saving initiatives (e.g. reduced team travel, reducing support staff travel, and mandating travel squads). In addition, the department has implemented numerous resource-generating activities (e.g. increasing the number of guaranteed games, increasing alumni engagement activities, and increasing coordination with institutional Advancement). The Department of Athletics will report financial status of cost saving and revenue generating to the president on an on-going basis. In February 2011, Grambling re-hired Williams as its head football coach. Best known as the first black quarterback to win a Super Bowl, Williams had succeeded the legendary Eddie Robinson in 1998, stepping down after the 2003 season. He returned after agreeing to a contract that included a guaranteed salary and performance bonuses, which he negotiated directly with Pogue. But the governing board from the University of Louisiana system never approved the deal, as the law requires, and it didn't intend to under the agreed-upon terms. Pogue asked Williams to renegotiate. Williams, who had already sold his home and moved back to the area, balked. In 2011, Grambling won the SWAC title for the sixth time in 12 seasons. But promised performance bonuses were never paid to Williams and his staff. Williams sued. In June 2012, the matter was resolved, and the board approved a new deal for Williams, three years at a reported $250,000 per year. 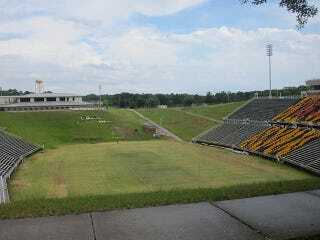 Then the Tigers slipped to 1-10 last year and went winless in the SWAC for the first time in school history. Over the summer, the university slashed two assistant coaching positions from Williams's staff and cut 6.3 scholarships, only to reconsider because the season was close at hand. Last month, Grambling fired Williams and chose to eat the remainder of his contract, which would have expired after the 2014 season. That interview was given just as the Tigers' men's basketball team was wrapping up a winless season that might have been the worst in Division I history.